This CADPAT (Temperate Woodland) Heavy Kit includes the Shirt and Pants in Canadian CADPAT Disruptive Camouflage Pattern. It also includes a CADPAT Digital Canadian Rhodesian Tactical Vest. All items are brand new and available in size S-M-L-XL-XXL. In use by Canadian Army, Canada Military Forces (Army/Navy/Air Force), Police and Special Security Forces. The CADPAT (Temperate Woodland) Camouflage Pattern has been first introduced by the Canadian Military Forces in 1996. It progressively replace the Canadian Forces OD Green Combat Uniform since 2002. The Woodland variation of the Canadian Disruptive Pattern Digital Camouflage is based on the Pixelization of Four-Color (Black, Brown, Dark Green & Light Green) and it is primarly designed for Temperate and Tropical Environments. This computer-generated pattern creates a "Dithering Effect" by using small pixels to eliminate hard boundaries between distinct colours and incorporates Low-Contrast Near Infrared Protection designed to counter Night-Vision & Detection devices. Currently in use by the Canadian Army, Navy, Air Forces and Security Forces (Variations of this camouflage are in use in many International Military Forces - ACU, MARPAT, US4CES and many others). 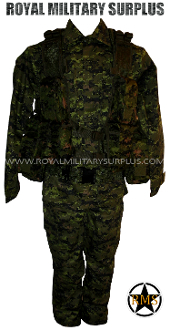 The Canada based Royal Military Surplus online store offers range of quality Military Kits, Combat Uniforms, Tactical Gear and Military Apparel in CADPAT Digital Camouflage Pattern.